AHTR has happily been the recipient of the good graces of CUNY (The City University of New York) in the development of successful models for using Open Educational Resources (OERs). Created in collaboration with Baruch College at the City University of New York, AHTR’s OER Repository benefits from a New York State grant of $4,000,000 for CUNY to establish, sustain, and enhance ongoing Open Education Resource (OER) initiatives across its campuses. While there are now many resources available for art history faculty enabling us to move from the traditional textbook, it is not always clear how those sources can be incorporated in pedagogically sound ways into the courses we teach. AHTR created a Repository that not only includes course content, but also offers insight into how these resources can be effectively used in class. The OERs materials added to AHTR provide an overview of Open Educational Resources with a focus on OERs as an opportunity to expand pedagogical choices, develop student information literacy, introduce a wider variety of course materials, and embrace interdisciplinarity. We will focus on OERs that may be of special interest to art history (beyond the wonderful smarthistory.org and museum websites). AHTR will publish materials authored or curated by art history faculty that introduce the resources, sample assignments, and other teaching artifacts that including a brief description of an OER; an assignment,lesson plan, or in-class activity using one of the open texts or resources contributed; and an introduction to teaching the materials. All materials are given a Creative Commons license in order to make it explicit that it can be used freely. The OER Initiative was designed to support CUNYFirst’s new “Zero Textbook Course” designation, which indicates course sections that do not require students to purchase any textbooks or books, printed or electronic. Students at four-year public universities spend an average of $1,250 per year on textbooks and related course materials. For CUNY students, this can be a limiting and sometimes impossible expense to bear. Using OERs allows students to obtain and engage with all the course materials at no (or much lower) cost. CUNY is in the process of developing a “Z-degree” in which students can complete their degree by taking all “zero-textbook cost” courses. 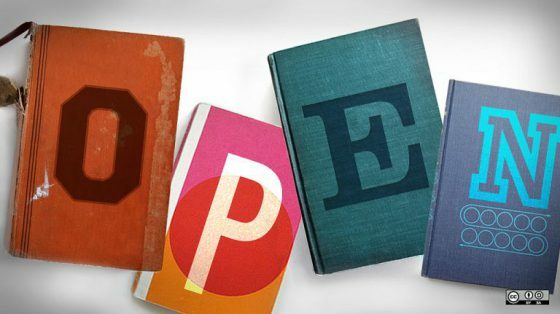 OERs Open Educational Resources (OERs) are teaching, learning, and research materials that have been released into the public domain under an open license. An open “intellectual property license…allows for free use, adaptation, and distribution”. This means that OER materials can be re-used, re-purposed, and “remixed” to better suit the user’s needs. The affordances of the open license are often referred to as the 5R permissions: the rights to retain, reuse, revise, remix, and redistribute these materials. OERs can be anything from open access (free) textbooks, to course readings, to educational videos, interactive websites or mainstream print articles. Any content that is free, in the public domain, and/or openly licensed can be considered an OER. Even your own notes or original PowerPoints! Some faculty members and universities openly license entire courses, including lesson plans, syllabi, readings, quizzes, and assessment tools so that they can be used and remixed by others. 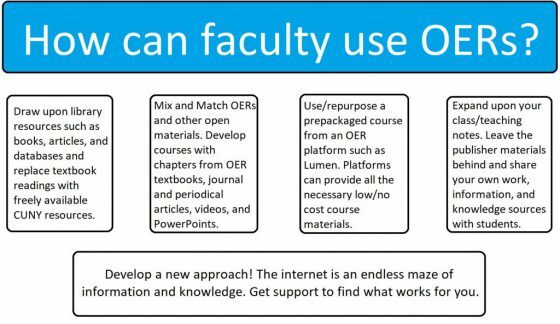 Some OER purveyors, such as Lumen, have developed full course offerings that provide all the necessary course materials to teach a course at a much lower cost than a typical textbook. Releasing open educational resources is not simply about putting learning and teaching material online; it involves making these resources available in a genuinely open way. Creative Commons or similar licences are used so that the creator of the resources can retain copyright, while others can copy, distribute and make some uses of their work. Open Educational Resources are shared via the websites of education providers and through public services like iTunes U, SlideShare, YouTube and Jorum. We hope that these initial resources are helpful. Please contact AHTR at info@arthistoryTR.org if you would like to contribute to this resource. We’d love to have your input!